March Break 2013 is fast approaching but CP24.com has you covered with a list of family-friendly ideas to keep you and your little ones busy and happy throughout your vacation. The city has a wide variety of leisure activities, as well as camp options available for children and their families. The Canadian Ski Council has created the Grade 4 and 5 SnowPass program specifically to make it easy and affordable for parents to get their kids skiing or snowboarding. 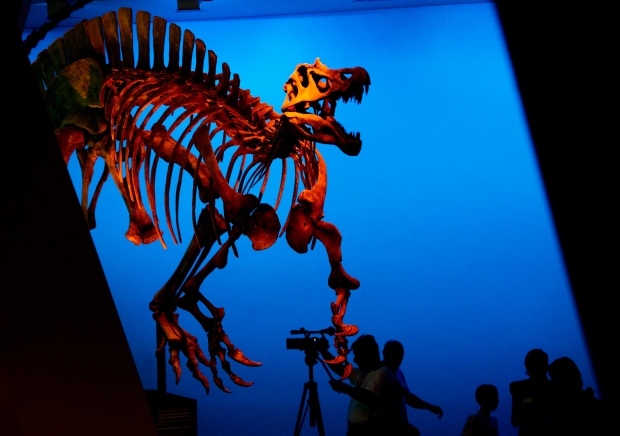 The ROM has day camps and activities for March Break, running from the 10 to the 18. Kids learn about animals, Dungeons and Dragons, weird science and more. The ROM has discounted pricing after 4:30 p.m. on Fridays. Families can keep warm inside any of the zoo's tropical pavilions. With a hot chocolate in hand, guests can also hear Keeper Talks and learn facts about polar bears, gorillas and more. Make sure to visit the newest addition of white lions in the African Savannah while you're there. Kids can sign up for the March Break Art Camp, where they’ll use recycled materials to make an "Itty Bitty City." Be sure to check out some of the current exhibitions while you’re there. Children under five are always free at the gallery and Wednesday evenings are free for everyone from 6 p.m. to 8:30 p.m. Enjoy some crafts at the BSM over the March Break, inspired by sneakers. Kids can tie-dye laces, bake shoe-shaped cookies and more. The drop-in activities are between 10 a.m. to 4 p.m. (March 11 to March 15) and the special pricing is $8 each for children and $8 for the adults accompanying them. Don't just watch the movies, make them! Sign your kids up for March Break camps that will give them the chance to explore filmmaking, through creating a mockumentary about the real lives of superheroes or by learning how different robotics and technologies work on camera. The camps are at 9 a.m. to 4 p.m. March 11 to March 15. Also at the Lightbox, there’s the Comic Book Heroes film series, and the whole family can enjoy Bell Free Weekend on March 16 - 17. This hockey-lover’s favourite attraction offers a chance to take shots on real-time goalies, call play-by-plays on some of the greatest goals, see hockey flicks and get up close and personal with the Stanley Cup. During March Break, the Hockey Hall of Fame has extended hours, 9:30 a.m. to 6 p.m. from Monday to Saturday and 10 a.m. to 6 p.m. on Sunday. The Harbourfront Centre offers several camps over the March Break, for kids interested in fashion design, comic books, cooking, dance, the circus and more. Camps are geared towards kids as young as three and teens as old as 17 and take place on March 11 to 15. It's a pirate's life with the Science Centre’s March Break programming: The Science of the High Seas. Kids will explore the different aspects of pirate lifestyle, including map making, navigating and designing ships. Programming runs from March 11 – 15, and the Science Centre’s hours are extended from 10 a.m. to 6 p.m. every day. Last chance to the Giants from Gondwana! Forget about the dinosaurs you know… this is a whole new breed of beast Mark your calendars for the biggest and best dinosaur exhibition ever mounted in Canada! Ultimate dinosaurs: Giants from Gondwana features dinosaurs you've never seen before, displayed in ways you've never seen before. Disney On Ice presents Rockin' Ever After! Get ready to rock out with some of the most magical idols of all in a musical showcase that features the hottest tunes and talent from across the kingdom in Disney On Ice presents Rockin' Ever After! Jam to a Scottish jig as a group of royal contenders from the latest Disney Pixar film, Brave, competes to win the heart of headstrong, sharp-shooting Merida, making her ice debut! Experience a show-stopping performance as Sebastian breaks out of his shell for one night only to make waves with Ariel. A chorus of harmless hooligans from Tangled unleashes musical mayhem when they get a visit from the sassy and spirited Rapunzel and her charming ally Flynn. And, get your feet moving as the Beast and his castle's enchanted entourage take center stage in a spectacular show for Belle. It will be a rockin' remix of royalty when Disney On Ice brings this superstar line-up to your hometown! Discount offer Mom Blogger Program Discount - 4 tickets for $44 on Weekdays and $4 off per ticket on Weekends - just enter MUM4 at Ticketmaster online checkout. This March Break, your child will have a blast at our March Break workshop as they also learn more about their own identity! We’ll show your children how to paint like a real artist as they create a textured background on a stretched canvas. They’ll get to add their own silhouette to the painting and finish off with personalised fingerprint “balloons” to customise their masterpiece. Older children can learn to sketch their own silhouette and younger children will be able to adapt their silhouette from our stencils. Just $25 for a 16×20″ take-home canvas, all supplies included! Simply book a time with us, and mention you’ll be joining us for the March Break workshop! It’s a sure sign of spring. Come out and ‘tap into nature.’ Demonstrations, wagon rides, activities and, of course, pancakes and maple syrup! Check our special March Break and Easter activities. Upper Canada Mall is bringing some fun 'ed-zoo-cation' to families this March Break! Visit the Upper Level near the Play Park to experience Zoo to You, a live exotic animal display featuring snakes, lizards, frogs, turtles and more. These amazing creatures will be available to interact with brave shoppers and curious children from 11am-5pm every day throughout the week. Bring your family out to meet the animals up-close and enjoy this exciting learning opportunity! Looking for some family &amp; furry fun during the March Break? Visit PawsWay between March 11th through the 15th for our annual March Break Madness! Events will include Learn to draw Your Pet, arts &amp; crafts, plus lots of fun games and prizes. Bring your dog with you and check out our Basic Agility Monday to Thursday from 11am to 4pm. Free! Pigmania The Hilarious Family Musical Rock along with a sax-playing Mama Pig. Party-loving Frankie and Woody join their whiz-kid sister,Brainella, and set out to make a life of their own. But sixties-throw-back Big Bad Wolf has some other ideas. High-energy fun, audience participation, and a large singing and dancing cast starring Juno Award winners, Judy & David! Prime: $34. Regular: $29. Family 4-Pak*: $100. *Minimum 1 child under 17 years old. Jamie Adkins presents "Circus Incognitus"
Enjoy the simple pleasure of being in the fragrant maple woods on a crisp March or April day. Smell the sweet aroma from the sugar shack as the maple sap is boiled down to syrup. Savour the hot pancakes fresh off the griddle smothered with our homemade maple syrup in the old log cabin. We have been welcoming people to our traditional, family-run operation since 1963. Come enjoy a day (or three!) of various art-making activities, explore our discovery space, visit the handling objects tables in the galleries or go on a nature hike! Track down our hot-spots by GPS and sketch what you see. Submit your sketches to the GPS info desk located in the Grand Hall and your work could be featured on our website! Also, don’t miss our new and old favourite performers at the McMichael for another rad and mad March Break. Catch a Perfomance at 1:30pm! March Break is a time for FUN! At Mess for Fun we provide five days of exciting activities for your child to keep busy and have fun during their time off from school. We are the fun and coolest place to be when school's out. We offer exciting and creative structured day for our campers. Camp activities include :- Crafts, Dance, Ceramic painting, Clay modeling, Photography, Mosaic, Magic, Animal show, Media projects – everyday a new activity. Ages 4 to 10 years Dates and Timings: Our camp program runs from 9 am to 4 pm for ages 5 to 10 years. Jeepers! SCOOBY-DOO and the Mystery Inc. Gang have been called in to help solve an epic mystery in Toronto. A trouble-making ghost is haunting a local theater and SHAGGY, FRED, DAPHNE, VELMA and SCOOBY-DOO are on their way in the MYSTERY MACHINE to help solve it! This hilarious live theater show brings everyone's favorite animated series to life. Filled with wacky new characters, fantastic songs and outrageous antics, SCOOBY-DOO LIVE! MUSICAL MYSTERIES, presented by Warner Bros. and Life Like Touring, will have audiences on the edge of their seats in traditional Scooby-Doo fashion. See if this time the gang is in over its head! Purchase tickets to this interactive, family-friendly show by calling 1-855-872-SONY(7669), online at sonycentre.ca, or in person at the Sony Centre Box Office. Black Creek will open its doors specially for March Break. Kids will enjoy sleuthing around the Village, in and out of the buildings, solving the mystery of the clockmaker. There is a mystery stirring! The Clockmaker is missing and so is his favourite and most valuable clock. Help Sherlock Holmes solve this mystery by finding clues throughout the Village. With activities in every building you will use your "signature detective skills" using methods such as disguises, observation, logic, clues & deduction and secret codes. Enjoy a Free Horse-Drawn Wagon Ride around the Village Watch a live puppet show called "Who's Calling?" Search for clues around the Village Solve problems & puzzles and question the Villagers Participate in a Spy Workshop Build disguises and make spy name tags Enjoy a variety of family friendly foods including Family Tea Time!